I was out yesterday at a local postcard fair and one of the images I found with this one. It is a small postcard image, badly creased and a little faded, and cost virtually nothing; the dealer almost gave it to me. But it is one of the more remarkable images I have rescued in a while. Why? Photographs of the wounded, especially the seriously wounded, are far from common. It was a well known fact during the war that King George V would not visit military hospitals as it ‘upset him’. That attitude was shared with a large part of the British public not touched directly by the war. 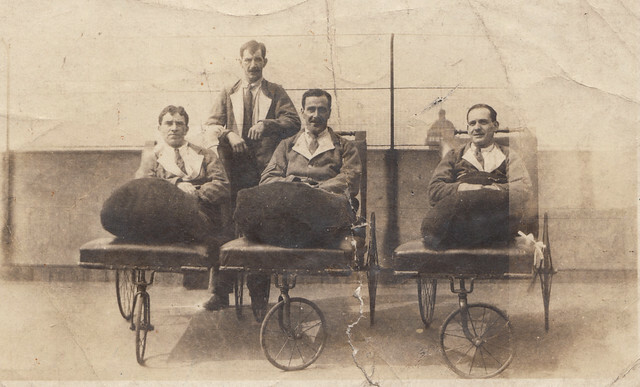 ‘Respectable’ wounded with light and less visible wounds, dressed smartly in hospital blues could easily be accepted but men with burns, or gas injuries and amputees were far less visible, and that extended to photographs as well. This image shows three wounded soldiers who are all double amputees; with the terrible injuries caused by shell-fire in the Great War these men were far from unique but they are very much missing from the imagery of the conflict. Many veterans felt that the dead were more readily accepted that the wounded, and that those injured on active service were somehow forgotten. A century later soldiers who are double amputees just back from conflict are again part of our culture but thankfully they are accepted and treated with dignity in a way that the wounded of the Great War were arguably not; the future for the three men in this photograph was potentially bleak – a meagre pension, little chance of work and a drain on their family. Some interesting statistics on The Long, Long Trail show that of the the 2.2 million wounded serving with the British Army some 8% were discharged as invalids, as these men would have been; three of the more than 182,000 who fall into that category. This entry was posted on 12/02/2012 by sommecourt. It was filed under British Army, Great War, Home Front, Hospital, WW1 and was tagged with Great War, Hospital, Wounded, WW1. Fascinating. Has much changed? How often are the badly wounded and misfired featured from current conflicts? It most surely be a deep seated human trait to honour dead heroes, but, dare I express it, show failure, even advertise the futility, waste, cruelty and damage of war? What will the 100th anniversary of The Great War bring? Another war? Thanks Paul, fascinating as always. This is really interesting. Its interesting you say these are rare. I was trying research it after finding pictures of a great, great uncle in invilids clothes. The family story suggests he was gases a Hooge.